Ever since my first visit back in 2009, Saam has remained my preferred way to dine at The Bazaar, as it affords patrons a reprieve from the hustle and bustle of the main dining room and instead presents a more serene experience focused almost solely on what's on the plate. Given that I quite enjoyed my last meal here, I'm a bit surprised that it's taken me over four years to return, but here I am. Back then, Michael Voltaggio was still in charge, but Saam is now run by Holly Jivin, with assistance from Barcelona native Aitor Zabala (Assistant Director of R&D for José Andrés' Think Food Group) as well as The Bazaar's main chef Joshua Whigham. 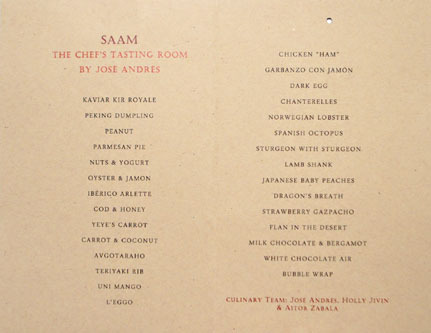 Saam's menu is usually 22 courses at $120 a head (with an optional $100 beverage pairing), but tonight we opted for an extended tasting priced at $160 for 29 courses. Click for a larger version. 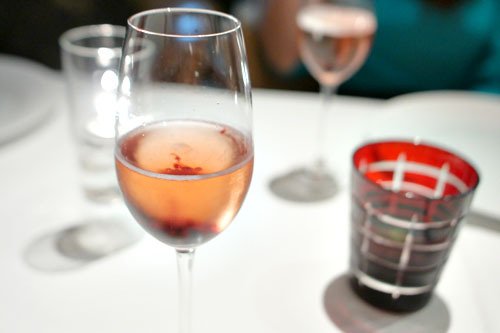 As always, a meal at Saam begins with a welcoming cocktail, and tonight it was a riff on the Kir Royal made with Cava, crème de cassis, and crème de cassis spherifications. It was a fitting apéritif, classic in essence, with the sweetness of the blackcurrant working well with the dry, crisp nature of the sparkling wine. 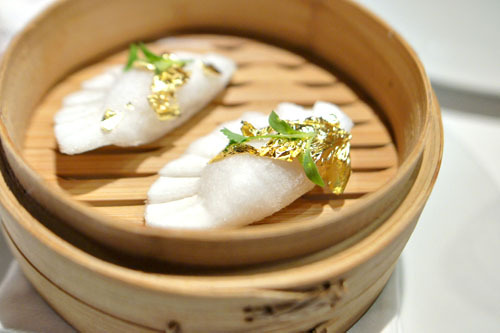 One of the highlights of the meal for me were these cotton candy dumplings stuffed with hoisin and chicharrón, then topped with microcilantro and gold foil. The sweet-savory interplay here was pretty genius, and I loved the herby overtones present as well, which served as the perfect exclamation point to the course. Definitely a "wow" factor here. 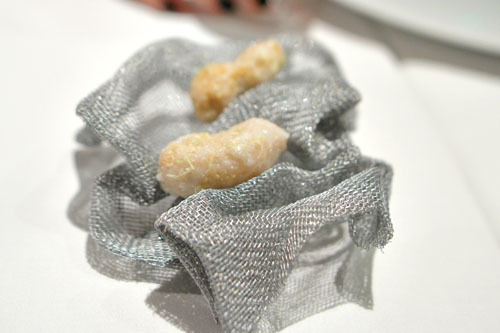 The "peanuts" were actually comprised of praline and red Thai curry in a sugar shell, dusted with lime zest and ginger. Think fun, nutty, crunchy, and sweet, with just a hint of piquancy from the curry and a whisper of ginger-y tang. 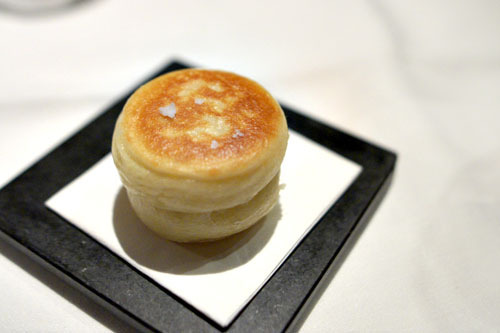 The world's smallest pie was composed of a Parmesan crisp, Parmesan cream, and basil. I really liked this one, with its mildly savory nuances on the attack leading to stronger, cheesier notes toward the back end, all with the herb adding an overarching, countervailing aromatic component to the bite. Yum. 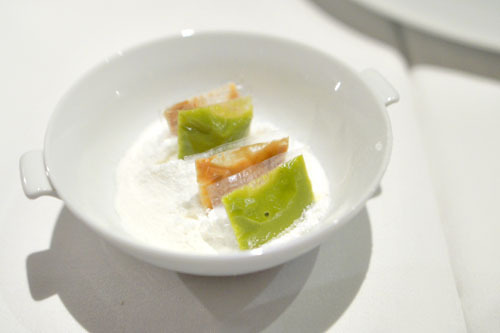 Here were "ravioli" of pistachio and pine nut encased in rice paper, all set in a yogurt powder. I first tried the pistachio variation, and found it creamy and tangy, with a surprisingly subtle undercurrent of nuttiness. The pine nut version was more interesting, with a particularly intriguing depth to it, but overall, the flavors didn't meld as much as I was hoping for. Instead of going with the standard wine pairing, we opted for bottles given our large party size (a dozen people). Starting things off was the 2003 Viura, Viña Gravonia, Rioja, R. López de Heredia. I quite liked this one, finding its oxidative quality a fantastic counterpoint to the dry, nutty character of the wine. Surprisingly refreshing, with just a hint of fruit toward the back. Next, a combo of savory ham, bright cilantro, and tangy lime segments formed a fitting complement to the inherent salinity of the Luna oyster. Particularly satisfying when taken with the paired wine. 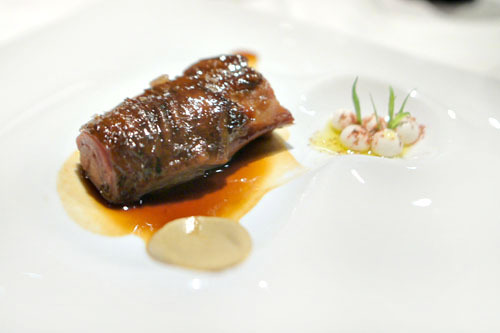 This curious looking course was an Ibérico cracker dusted with gold and thyme. It was very light on the palate initially, with the savoriness of the ham only coming through toward the lingering finish, though I would've liked the lushness and unique character of the Jamón to have been more readily apparent here--it was a bit too subtle. 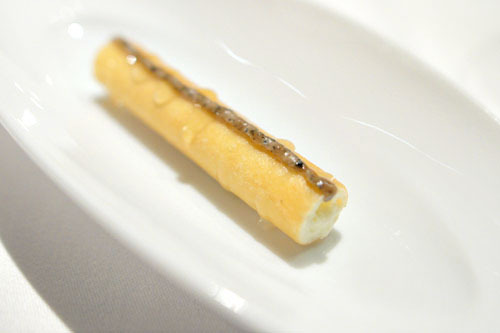 Cod espuma was wrapped in brik dough, then topped with a line of honey-truffle purée. This was another winner, with the earthy, unabashedly sugary nature of the condiment working wonders against the creamy, fishy base of the dish. 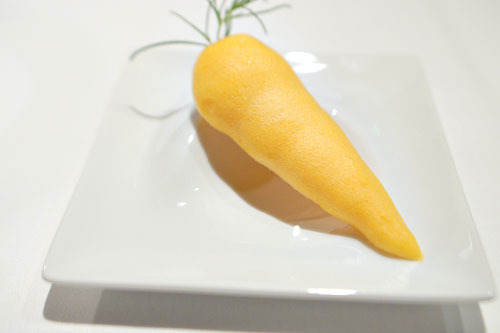 This faux carrot was comprised of a carrot meringue hiding a carrot-ginger sorbet, all garnished by sea grass. 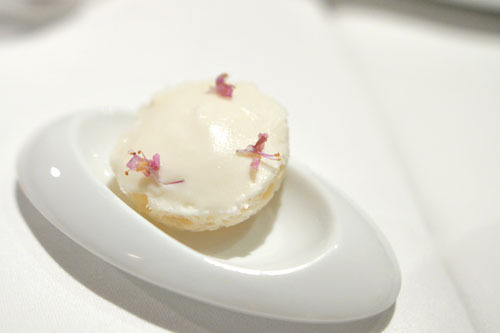 It was a classic pairing of the sweet-n-spicy ingredients, and I found the dissolving nature of the meringue particularly interesting here, though quite a few members of my dining party didn't care for this one at all. 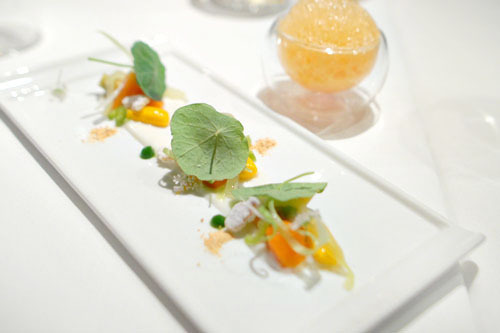 Sticking with the carrot theme, here was a dish of coconut-cauliflower purée, nasturtium, coconut crisps, carrot air, and fermented carrot. It was positively fascinating, a lovely mélange of disparate textures and contrasting bright, savory, spicy, and sweet flavors that were almost Asian-y in essence when eaten together (even recalling Korean namul with one of my dining companions). Keeping with the oxidative bent, next was the 2008 Orange Pinot Grigio, Ram, Venizia Giulia, Italy, Malina. This was to my liking as well, with a smooth, soft fruitiness to go along with the more austere flavors present. Here, in a nod to the Greek mullet roe dish of the same name, we had sturgeon roe and burrata in a seared bun, topped with a sprinkle of Maldon. It was a tasty morsel, salty and heavy and satisfying, though I would've preferred a slightly lighter, smaller bun. Just about the daintiest rib ever featured the sushi staple of kanpachi, joined by wasabi, red curry, and black sesame. It was a delectable offering, with the sweet, smoky nuances here playing well with the ocean-y flavors of the amberjack. I'd have no problem demolishing an entire rack of this! Arguably my favorite course of the night was this reimagined nigirizushi. 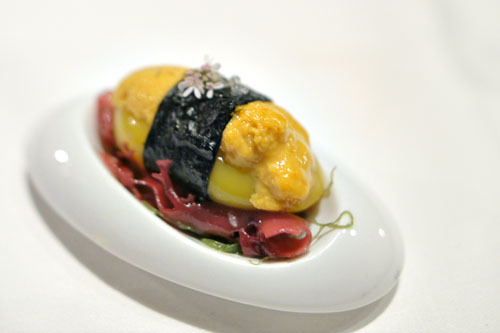 We had uni, of course, over a mango sphere, with yuzukosho, cilantro flower, and nori. 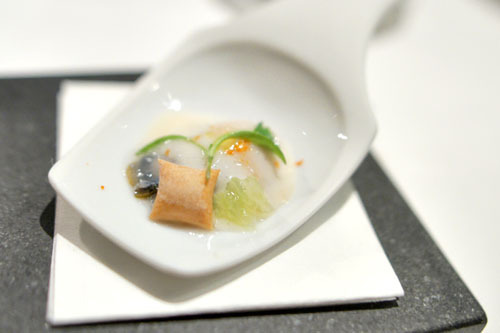 The key here was how the sweetness of the fruit melded flawlessly with the complementary flavors of the sea urchin, forming a complex of sugary, briny goodness that was dutifully tempered by the umami-laced relish (as well as crunch) of the seaweed on the finish. Masterful. 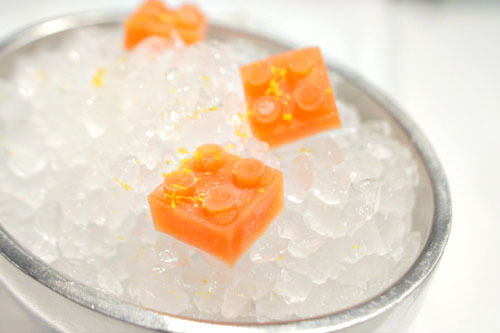 Next, a throwback to my childhood favorite Legos, reinvented here as a sort of Negroni, one composed of Campari, orange, and orange zest. It was a bright, bracing bite, with a deft blend of sour and bittersweet flavors that definitely jolted the palate. 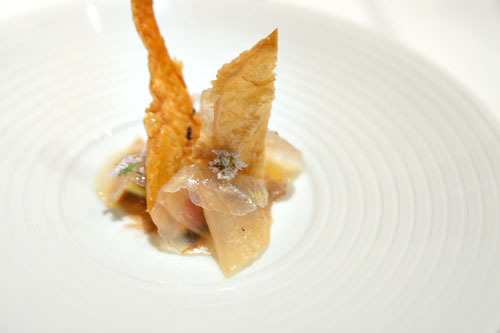 Eight-hour cured chicken was accompanied by prawn praline, figs, black garlic, and everyone's favorite, chicken skin. It was an unconventional, but effective combo, sweetish at first, with the savoriness of the bird coming through strong toward the close, all with a sort of overarching, moderating herbiness. 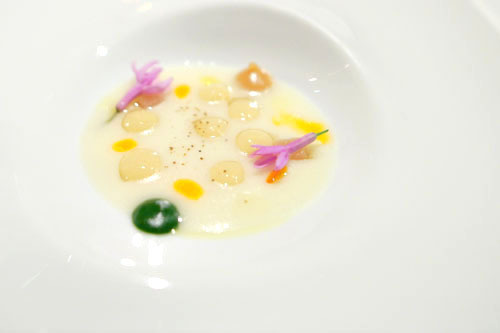 A potage of garbanzo came with jamón cream and parsley purée. I found it hearty and garlicky, with an almost ramen-like savoriness and an effective, counterbalancing zing from the parsley. At this point, we moved on to a beer, the Imperial Black IPA, Dubhe, Urah, Uinta Brewing Co. This one was pretty cool, with plenty of dark, malty, chocolate-y flavors tempered by a great touch of hop bitterness. 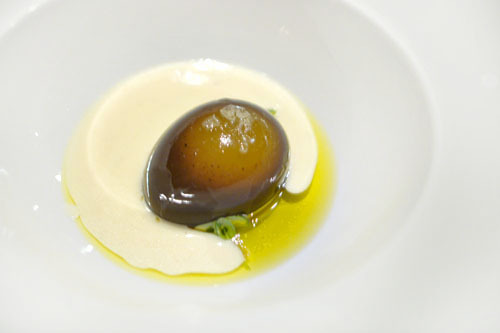 Another standout was this sort of reworked century egg, one made of a sous vided yolk spherification encased in a truffle gelatin with Parmesan, all set in an olive oil base and paired with a tableside carbonara sauce. It was all that you'd expect: rich, lush, and luxurious, with the runny goodness of that egg beautifully matched by the heady nuances from the truffle, all while the carbonara served to tie everything together. Delish. 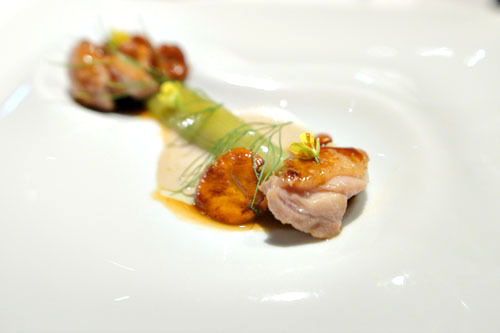 Chanterelles formed a natural pairing for chicken oysters, along with fennel and a mushroom cream. The heady, earthy taste of those 'shrooms made for a seamless complement to the immensely flavorful bird, all while the fennel added a wonderfully zesty foil to the dish. 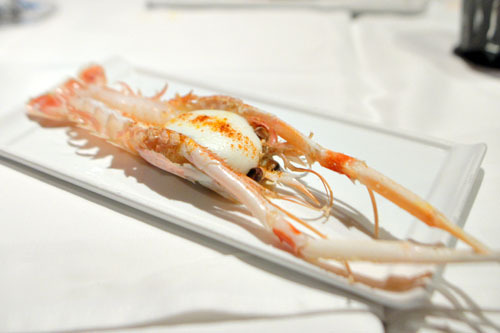 Langoustine was super briny, really tasting of the ocean with a subtle sweetness to it that worked hand-in-hand with the tempering potato espuma, all while the paprika added just a tinge of spice to the dish. Our sole red wine was the 2001 Rioja, España, Reserva Señorío de P. Peciña. This one had some nice age on it, and showed off pleasingly tart, but silky fruit notes bound by some mild tannins and a nice bit of earthiness and alcohol toward the end. 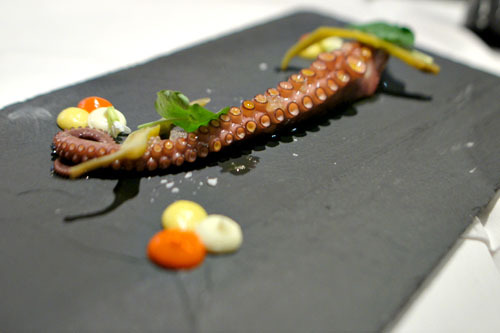 Poached octopus was accompanied by piquillo, corn, aioli, guindilla pepper, and nasturtium. The tentacle tended toward mild, and I would've liked more of a savory, charred (and crisp) character to it, though the Spanish influenced flavor combinations definitely made sense. 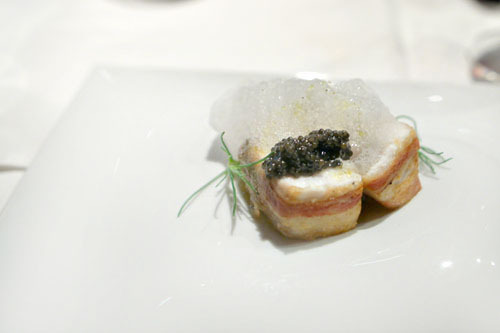 Another favorite of mine was the sturgeon, which arrived wrapped in pancetta and topped with Almas Ara caviar and sprigs of sea grass. The fish was really a shining example of sturgeon: soft and succulent, with a wonderfully salty character to it that I found immensely satisfying. Very nice. 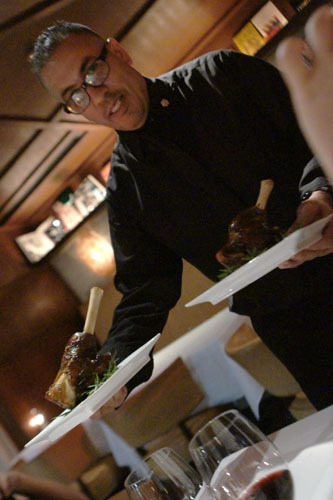 The lamb shank for our next course, presented tableside before being taken back to the kitchen and plated. For our last savory course, sous vide lamb shank came with eggplant, yogurt, and za'atar. The meat itself was peppery and deep, with an apparent ovine relish to it, thought it really could've stood to be more tender to the bite. That being said, the smoky, creamy notes here really worked with the lamb, and I was especially fond of that yogurt. 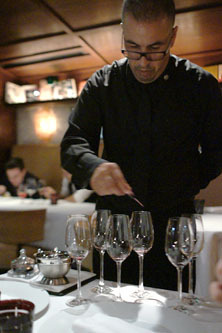 At this point, we requested a supplemental course featuring The Bazaar's signature Philly cheese steak. 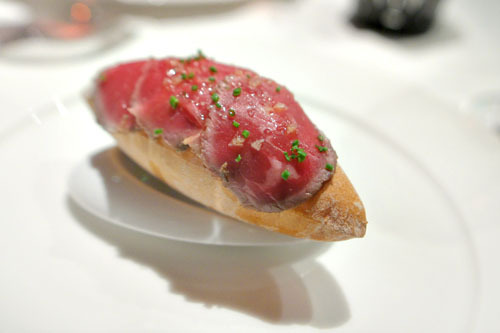 It was hard not to like, a blast of beefy, salty, and cheesy flavors, offset just a bit by the airy nature of the crunchy bread. 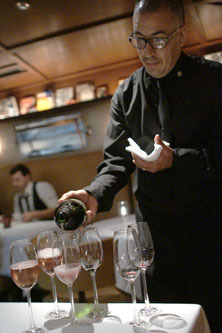 To pair with the desserts, we were provided the 2008 Vidal Ice Wine, Canada, Konzelmann. It was just as you'd expect from an ice wine, coming to us viscous and sweet, with loads of stone fruit flavors joined by just a smidge of nutty goodness. Nice! Our first dessert was a variation of a dish that's been on the menu since day one. The sweetness of the peaches was nicely conveyed here, expertly complemented by the savory, nutty notes from the Di Stefano burrata, brioche, and hazelnut praline. Some nice textures here, too. The omnipresent Dragon's Breath (basically a sweet, cool bite of liquid nitrogen-dipped popcorn) was as fun as ever, especially for the newbies in the group. 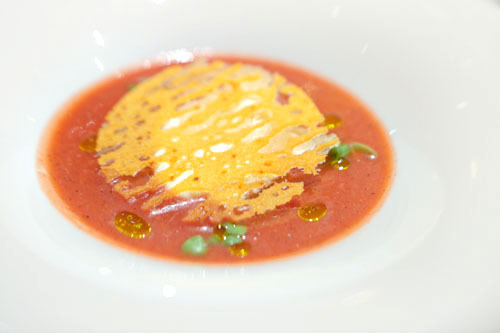 A strawberry gazpacho was tangy and sweet, a refreshing course amplified further by the vanilla, lime, and espelette notes present. A bit of a substitution here: the so-called "Desert in the Desert" dessert was served to us in place of the "Flan in the Desert" advertised on the menu. 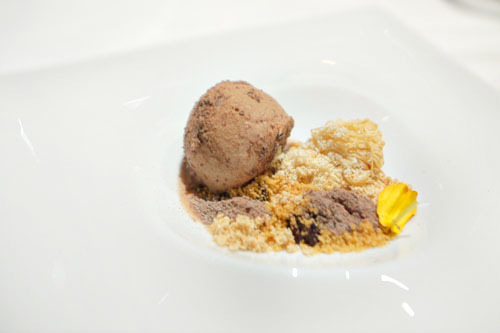 What we had was a chocolate-cardamom ice cream in almond dust, dehydrated cherry, and raspberry purée. There was a lot going on, but everything definitely made sense, with a wonderful sweet spice joined by a multitude of flavors, all offset by a nice crunch to the course. 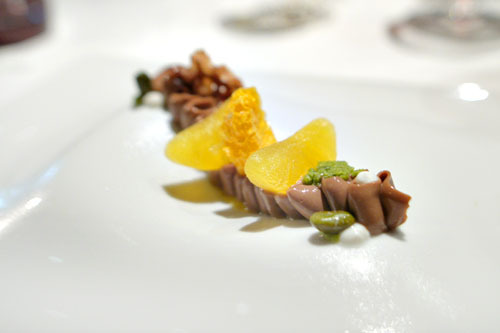 Our final proper course comprised a milk chocolate cremeux, chocolate croquant, pistachio coulis, Greek yogurt, and mandarin oranges. This was a smart reinterpretation of the classic combo of chocolate and orange, all finished with a delightful nutty tint. We concluded, fittingly, with our mignardises course. My favorites? 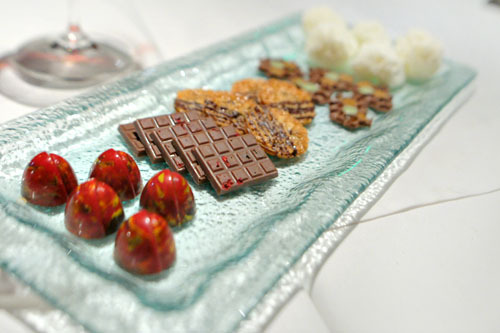 The disintegrating white chocolate air and the sweet-nutty, pop rock-infused raspberry explosion bon bons. 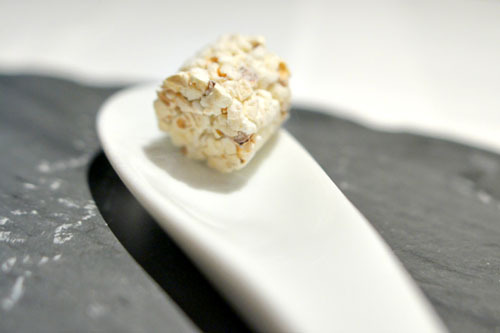 And to take home: The Bazaar's take on Rice Krispies treats. 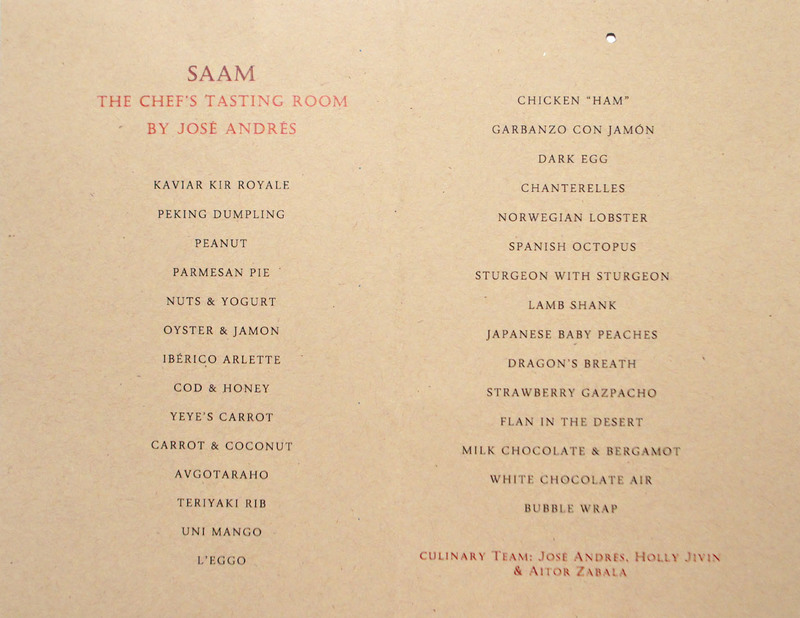 It was great to revisit Saam after all this time and see how the restaurant has evolved. 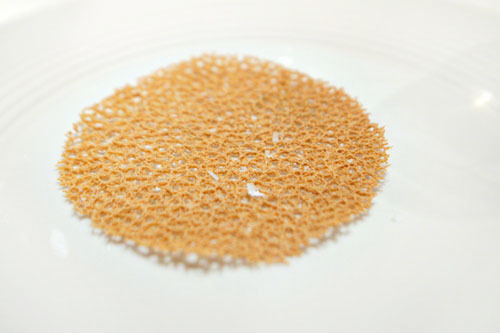 To me, the cooking's gotten a little less "molecular" and a bit more ingredient-focused, though the whimsical presentations and inventive flavor combinations remain. 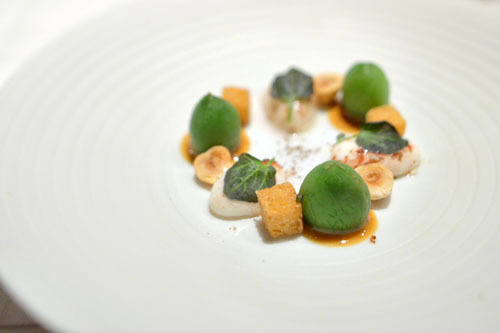 The food was as fun and tasty as I remember, and Saam's still one of the most unique dining experiences in LA to be sure. This is the type of place that should be on your bucket list. 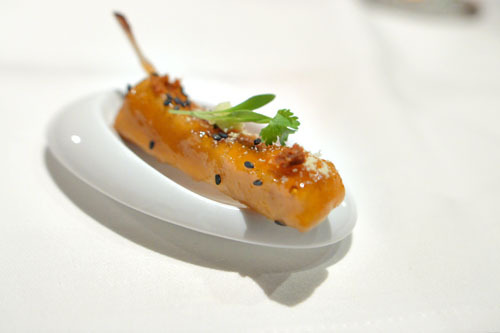 When Jose Andres gives your reviews 'props, it is time for everyone to read... Kudos !!! It's nice to see that they have changed up 75% of the dishes. I've been 4-5 times now and on a couple of those there were only 2-3 changes between meals. At least one time I didn't even bother blogging it because it was so similar. I'll have to head back soon and try out these new stuff. I like how there is a stronger emphasis on trompe-l'oeil, which is always fun. 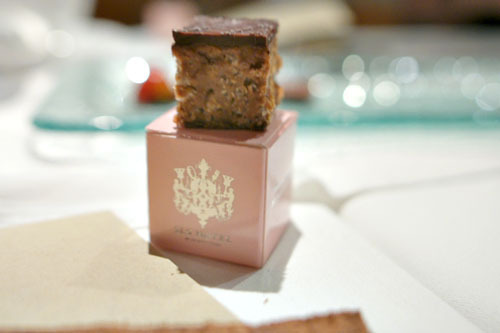 Did you ever try one of their over-the-top dinners like the $250 truffle dinner? That being said, my only beef with them is the reprehensible corkage and water charges. Once I think I paid $250-300 for water at a table of 5! Kevin, great review! Just curious, can anyone eat at Ssam at The Bazaar or is it a special private dining room that you need a large (10 people) party for? Or is it like Minibar where there are only 6 seats? Can just two people (a couple) get a seat? How do you make so much money? TEACH ME YOUR WAYZ. Allan: Indeed. Always nice to get a nod from the man himself. James: Thanks for the heads up on that link--totally would've missed it myself! Andy: After four years I'd hope that they would've mixed things up a bit. ;) I can see your frustration about the lack of change though--never been to one of their truffle dinners unfortunately. But yeah, the corkage here is pricey, and our water charge was $154, so not nearly as ridiculous as yours, but still high. Anon: You don't need to "make so much money" to eat here. hey kevin, are you going to any of the wolvesmouth "cut your teeth" dinners?